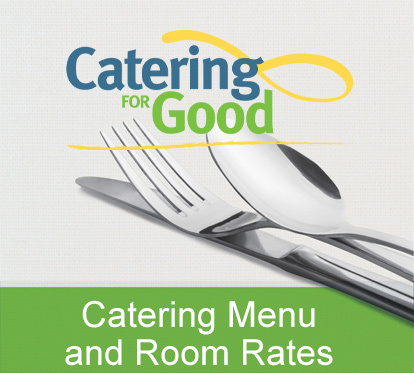 Catering for Good is a full-service caterer offering high quality food and service. Menu selections are prepared by our award-winning Chef Jill Holland from scratch using only the freshest high quality ingredients from locally sourced reputable food distributors. Food donations are not used for catering. Our catering and events team works closely with you to realize your vision and assist you in selecting the perfect menu for breakfast, lunch, dinner or cocktail reception. We can either serve you and your guests in our venue or at an off-sight location such as your home, office, or other area venues. Second Harvest is one the most unique venues in Central Florida. Our 100,000-square-foot facility provides an opportunity to host a memorable experience in one of our state of the art Community Rooms and can accommodate guests from 10 to 200. Each room offers built in AV equipment and is included in the room rental. Our beautiful Atrium is perfect for a reception or corporate mixer. The revenue generated by your event will transform lives and supports our Culinary Training Program. Plan your next workshop, association luncheon, corporate event, holiday party, bar or bat mitzvah, wedding, shower, anniversary and birthday party with us and you will enjoy catering that not only tastes good but does good! View catering menu. Make your holiday party a life changer when you purchase a catered meal prepared from our Darden Foundation Community Kitchen. Enjoy a made-from-scratch, delicious meal, and feel better knowing your purchase will go back into our community kitchen and support our Culinary Training Program. More info on Holiday Catering coming soon. Questions? Please fill out the form below. Yes, it's ok for me to receive email from Second Harvest. Question - Not Required - Sign me up to receive updates! yes, add me to your culinary events email list. A 3,100-square-foot space designed as an affordable gathering place for meetings and special events. An optional picture-window view of our distribution warehouse is available. The Community Room offers state-of-the-art AV. Bank of America Board Room. This area offers all the necessary functionality for your important meeting, including free WiFi, audio conferencing capabilities and AV. A great setting to mingle, this space is ideal for cocktail receptions and networking events. An open and dynamic event space well-suited for large-scale functions, this space can be used for parties and weddings, as well as corporate engagements.